The yak hair tent wasn’t so much warm as it was a barrier against the sharp Himalayan wind. The temperature inside was –5 degrees Celsius, outside the wind beaten tent the temperature plummeted even lower. I wasn’t sure if it was the cold that woke me up at 3 A.M. or the constant pounding headache from mild altitude sickness as I lay bundled in the less than warm cocoon that was my Chinese knock off “North Face” sleeping bag. At some point I thought a stroll outside the tent would restore some need to sleep. Outside the tent a pristine tranquility I had not previously experienced pervaded the frigid air. I looked up at the moon as it illuminated the snowy peak of the massive sheer cliff that is the north face of Mount Everest. The soft glow of the pale moon gently twinkled off the frozen glacier stream next to my tent. The only sounds the robust gusts of wind, the gentle trickle of water through cracks in the frozen stream, and the occasional clanking of bells from the numerous Yaks milling near the tents. Above Prayer flags twisted in the wind and multicolored tents of various expedition teams sat perched on the rocky plane in the shadow of Everest. The cold air seemed to make everything appear in slow motion. Higher than the peak of Everest, if such a thing were possible, loomed constellations of stars brighter than I’ve seen before as occasional wisps of clouds transiently obscured the moon. 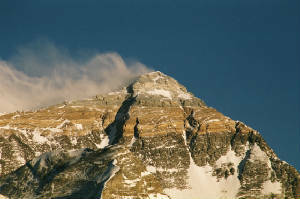 Tibetans know the great mountain as Chomolangma “mother goddess of the universe”. A British Archeologist surveying the region in 1852 later named it Mount Everest in honor of Sir George Everest the great surveyor and geographer who was largely responsible for the completion of the Great British Trigonometric Survey of India in the first half of the 19th century. 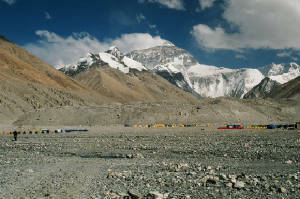 Everest sits on the border between Tibet and Nepal. Just over 2000 people have reached the summit Since Sir Edmund Hillary and Tenzing Norgay first reached the summit in 1953. Around 200 or so people have perished in their endevours to conquer the summit, most of their bodies still rest frozen in perpetuity on the climbing roots high on the mountain. From the capital Lhasa and back the trip to Everest requires five full days drive by Land Rover though vast unpaved dusty expanses of southern Tibet. I had met three other backpackers in a hostel in Lhasa and together we charted an old Land Rover with balding tires, a fearless Tibetan driver, and a handful of various travel permits. The trip was serene as the driver jammed out to the same few warped Tibetan pop cassette tapes over and over again for 5 days. We climbed up and down 16,000 foot passes and harrowing icy switchback trails on precipitous paths flanking the edges of large mountains. Occasionally on the side of the road of far below the carcasses of vehicles that had plummeted from the dodgy paths reminded the driver to exercise as much caution as I suppose you could under those conditions. At one point the driver had us get out and walk as he navigated a particularly narrow stretch of treacherous mountain road where the edge of the tires were literally inches from a steep drop off hundreds of feet down into a valley below, we all look on in amazement. As we reached the higher peaks the driver encouraged us with his broken English to drink lots of fluids and not to fall asleep lest we succumb to the effects of high altitude sickness until we were more acclimated. We rolled past massive impossibly turquoise lakes, large barren sand covered cliffs, steamy hot springs, and expansive dusty planes. The road snaked past hardy yak herders shepherding their animals along unspoiled rivers and weaved by remote Tibetan style houses with huge stacks of bricked yak dung for heating and fuel. On the initial leg of the journey we saw nascent tracks under construction of the “impossible railroad”, an ambitious feat of engineering that China hopes will one day better link the rugged province. Along the way before we got to base camp we stayed in a few remote villages where we warmed up with yak butter tea and Tibetan soup. We also visited a few larger villages along the way, the most notable of which was Shigaste where the Tashinlumpo monastery is the tradition seat of the Panchen Lama, second in importance only to the Dalai Lama. Gynaste was another impressive city with a gleaming fortress looming high above the city and assorted monasteries. Finally after seemingly traveling forever the last leg of the trip was by mule and then by foot to the base of the mountain. I had brought several canisters of oxygen, 8 liters of water, and an assortment of random breads, nuts, and candies bought in Lhasa days before. I felt excited about base camp. It took a little getting used to initially as merely walking around at 17,000 feet was exhausting, but I didn’t end up using the oxygen as they say once you open your canisters you become somewhat addicted at these altitudes. You do though gasp for breathe every couple of steps uphill, especially when as an itinerant backpacker you are pressed for time and have had no time to acclimate. Your head pounds constantly from hypoxia and low atmospheric pressure. Your nose is constantly bleeding, and the dry air causes you to cough seemingly incessantly. Your blood oxygen saturations which normal hover at around 98% at sea level plummet to the 60-70% range until you acclimate after several weeks. These minor inconveniences aside the majesty of the mountain is incredible if not astonishing. To view the last amber vestiges of sunset glow off the shear rock face of the North Face of Everest defies belief. On an otherwise clear day plumes of clouds spill over the summit from the south face Nepali side of the mountain like smoke from a Himalayan chimney. At the foot of the mountains sits an expansive plane of ice and rock dotted with colorful single man tents. Late spring brought the peak climbing season and there were at least four expedition teams acclimating at base camp and a few other had made bids for the summit. I only made it up as far as base camp but perched further up the mountain sit camps I, II, III and finally the summit at 29,035 feet. Heading up much further than base camp requires crampons, boots, proper climber gear and even more permits. 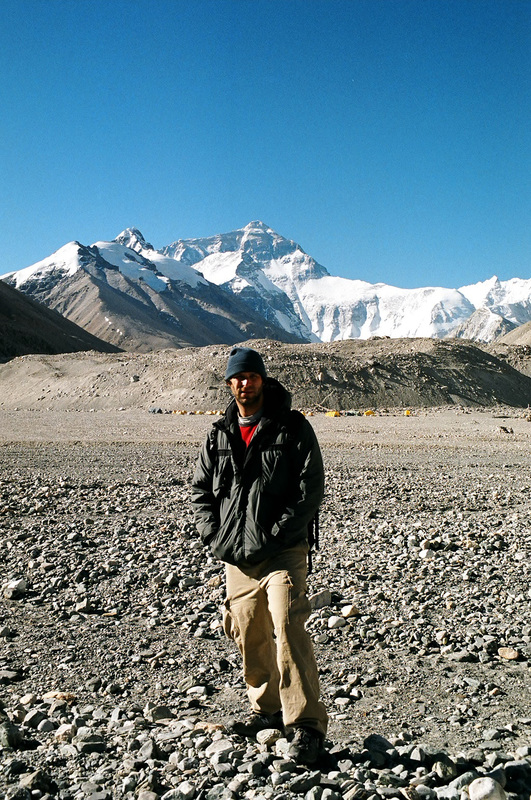 During the day I hiked around base camp and marveled at the mountain as wisps of clouds streamed above. There were expedition teams from China, India, Norway, and the Former Yugoslavia based in the shadow of the mountain near my tent. Each of the teams had a separate campsite consisting of perhaps 15 colorful tents and climbing gear. As the expeditions climb higher and higher attempting to reach the summit they are guided by an expedition leader who remains at base camp. The expedition leader relays weather information and other data by satellite phone to the team higher above. One of these expedition leaders directing the Yugoslavian team was a quirky guy from Montenegro called Miko. He was a gruff man in his mid fifties and his penchant for alcohol even at base camp was only rivaled by his outrageously hilarious monologues. The tent where I stayed with about six other backpackers was a social tent as it were, and people from various expeditions came by to eat soup cooked on a small yak dung stove, a family that ran the tent even somehow managed to shore up good business selling beer brought to the camp by yak. Miko with his acerbic Eastern European accent was perhaps the funniest character I’ve ran into during my trip. One night as a bunch of backpackers and expedition types were gathered in my tent a Norwegian climber came back down to base camp after a failed attempt to climb the mountain, his aspirations cut short by a few broken ribs. The amusing Miko advised him “drink beer its like glue for the ribs” as he chomped on a hairy slab dried sheep meat and everybody cracked up. Between beers he also insisted that “the Yeti only eats backpackers”, I laughed so hard I felt short of breath. Miko sporadically chatted by satellite phone with his team at camps much higher on the mountain where conditions were less than ideal for climbing. They had been facing 120 km/hour gusts of wind and temperatures of –20 Celsius and might need to come back down to base camp if conditions did not improve. Miko told us two people from another expedition had died high on the mountain the day before so his team was staying put until conditions improved. The crisp aroma of burning juniper pervades the air as occasional gusts of wind whip up storms of dust. The weathered tin of thousands upon thousands of squeaky prayer wheels spin in perpetual motion during the day, the wooden handles finely sanded from being spun countless times by the tireless hands of pilgrims. Tibetan faithful with prayer beads in hand and exotic dress gather from near and far to circumambulate the prayer route surrounding the base of the Potala Palace. 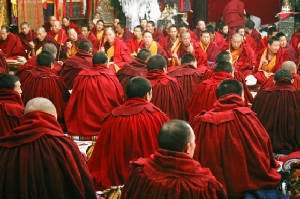 The route is one of Lhasa’s several “Kora” or circular prayer routes. Pilgrims from remote Tibet come to walk the Kora circuit clockwise clad in traditional aprons and assorted hats. Many bear permanent scars on their cheeks from countless sunburns. Lhasa is the highest capital in the world and the unfiltered sun shines bright through the thin atmosphere at these altitudes. Men wear their long hair wrapped around their head like turbans with colorful red yarn extensions interwoven. The particularly devout complete the huge prayer circles by prostrating themselves first to their knees and then lying flat on their chests touching their foreheads to the ground, each time getting up taking several steps and returning to slide back down to the ground and repeat the process thousands of times until they complete the Kora. Thick leather aprons and wooden clogs on their hands protect their skin from the constant friction of the ground. Some bear large scars on their foreheads from the process of touching their heads to the ground incessantly, these are said to be the most spiritual. 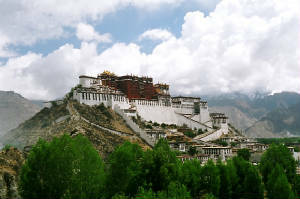 The Potala itself is perhaps the most iconic symbol of Tibet. Perched on a large hill overlooking the city the exotic whitewashed citadel inspires awe, an endless labyrinth of rooms and temples it is dizzying to explore. 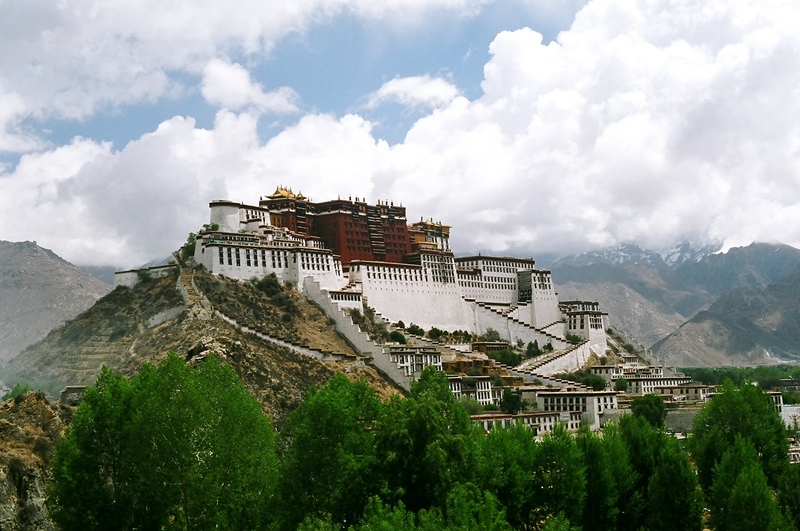 The fifth Dalai Lama moved the Tibetan capital to Lhasa in the early 17th century and construction of the Potala began in 1645 on the ruins of an earlier fortress dating from the 7th century. Since then the Potala had been home to all Dalai Lamas until the 14th Dalai Lama fled. The Chinese communists invaded Tibet in 1950 and massacred countless thousands in the process of “liberation”. The Dalai Lama stuck around until 1959 when the Chinese shelled the Potala. He fled at night disguised as a soldier and made his famous 14 day trek across the Himalayas into India. He eventually settled in Dharamsala where he still presides today. Unfortunately the Chinese have continued to raze Tibetan culture since taking over, even subsidizing massive Han Chinese immigration into Lhasa in an attempt to further dilute Tibetan culture. 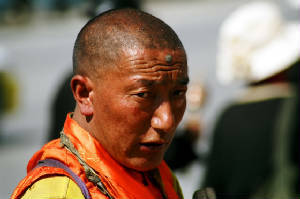 Merely possessing a picture of the Dalai Lama is illegal and grounds for arrest. Despite all this the Dalai Lama remains the spiritual leader of Tibet in exile. Sadly his dream of a “Free Tibet” is unlikely to ever come to fruition. China’s aggression aside Tibet remains a fascinating place where temples abound and the sun seems to shine bright every day. Monks in their red cloaks amble past small tea houses and all manner of beggars sit on sidewalks supported by offerings of the humble denizens of Lhasa. Strolling around Lhasa feels like stepping back in time as clouds of incense billow from large chortens. There were also a number of shops stocked full of the latest cassette tapes of Tibetan music. Western medicine doesn’t seem to exist as such in Tibet but eastern medical doctors do exist and Tibetan pharmacies abound selling all manner of questionable eastern herbals for medical purposes. And then there is the Yak…… old women walk around selling steaming yak butter tea from small kettles all over the city. There are the outdoor butcher shops with large unrefrigerated yak carcasses hanging from strings buzzing with flies, other shops stock massive slabs of yak butter and yak cheese, outside and inside temples thousands and thousands of yak butter candles burn brightly. I stayed in the “Yak hostel” and ate yak steak and even had yak burger. Yes Tibet is all about the yak. In fact the lonely planet guide book clearly states no trip to Lhasa is complete without a stop in Tashi’s restaurant for the yak cheesecake (very tasty if a little sour). Not far from Lhasa sits Sera monastery a sprawling settlement where hundreds of monks live and worship. The most interesting element of the monastery is a pleasant shaded courtyard where the monks debate daily at 3:30. 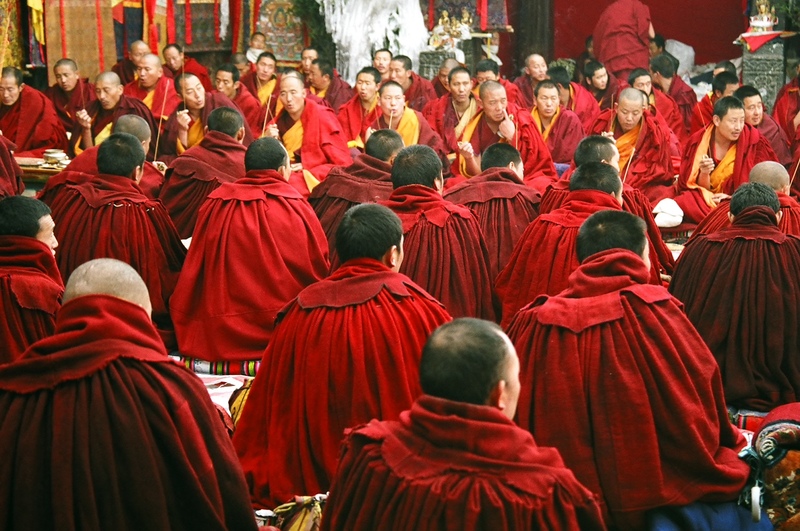 These debates are noisy affairs and quite the fascinating pastime as throngs of monks yell and shout loudly at each other in exotic Tibetan tongue. They slap their hands fervently and gesticulate erratically, a peculiar sight to be sure to see such normally subdued monks so animated. The Jokhang temple stands as another of Lhasa’s great Buddhist temples. The temple is surrounded by the bustling Barkhor square, a fascinating Kora route filled with wandering pilgrims, unusual bazaars, and mazes of side streets radiating from the main Kora. The Jokhang temple is widely regarded as one of the most sacred sites in Tibet and houses a series of chapels, sculptures, and a hallowed main sanctuary. Inside the temple countless monks sit in pensive meditation chanting strange Buddhist mantras in low guttural frog like voices, the mass effect of the mumbling voices is an odd low pitch roar. Between the chants the monks silently eat simple gruel from copper bowls as worshippers donate fruits, money, and other assorted alms to the temple.